Have your liege lords or vassals ever used the term "free-spirited" to describe you? Did your royal forebears endow you with a very large... ahem... sword? And is "chivalry" not really your cup of mead? If the answer to any of these questions is "aye, what's your point?" then you, good sir, have chosen the right finery! We applaud you for your taste, as unconventional as it might be! 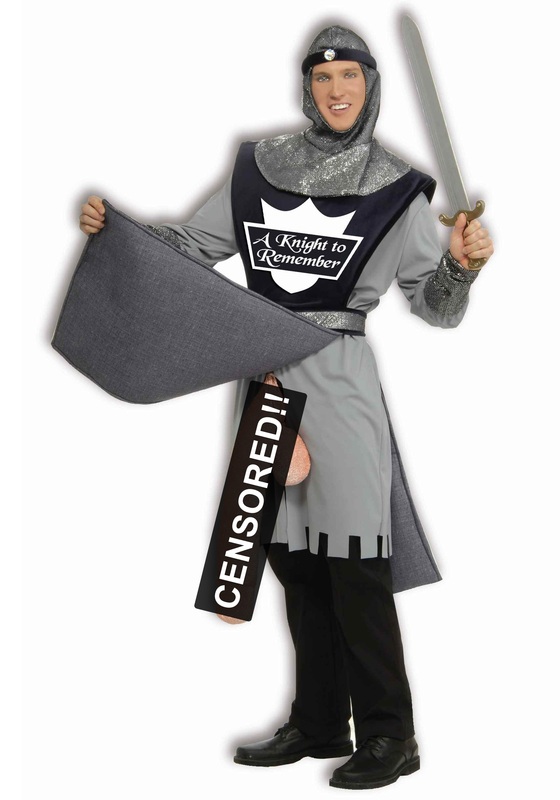 So this Halloween (or the next renaissance fair, if you so dare), make your own medieval mark with a garment they'll never forget: A Knight to Remember Costume! Sure, the rest of the royal court may have small quibbles about you, but there's nothing "small" about your brand of swordplay. And they certainly can't assail you for how you handle your enemies, and that's with the tried and true element of surprise! Just flip up your tabard, and pretty much everyone in the realm will be shocked to see how well-armed you are! And in case they weren't sure after such an awesome display of medieval might, all they need do is read your family coat of arms (printed on your fine tunic). While some may criticize it as simplistic, it gets the point across with the elegant motto of your noble House, "A Knight to Remember." For a "knight" of truly royal and debauched fun, head out into the taverns with the Knight to Remember Costume! And don't forget, even "naturally" well-armed knights need to carry a little steel with them now and then. You know, just in case someone gets jealous and wants to joust. So check out our wide selection of renaissance accessories, including swords and other weapons!